Given the disparity between rural and urban areas of western Ohio in high-speed Internet infrastructure, many regional community anchor institutions struggle to obtain critical broadband services, while last-mile service providers have difficulty obtaining the backhaul capacity needed to serve these areas. Com Net’s GigE PLUS project proposes to construct almost 700 new miles of high-capacity fiber to expand an existing network throughout 28 western Ohio counties. Com Net expects the enhanced network to provide speeds of up to 40 Gbps to as many as 880 community anchors institutions, and middle mile network speeds up to 100 Gbps to the region’s 33 last-mile service providers. The project plans to directly connect 212 K-12 schools, 173 state and local government offices, 112 public safety facilities, 84 health care facilities, 12 community colleges, four universities, 43 libraries, 92 public housing facilities, 151 community support organizations, and five state parks. Com Net’s GigE PLUS Availability Coalition project deployed more than 570 miles of new fiber through June 2013. These new miles are part of Com Net’s plans to install approximately 650 miles of high-capacity fiber-optic cable across 28 counties in western Ohio. 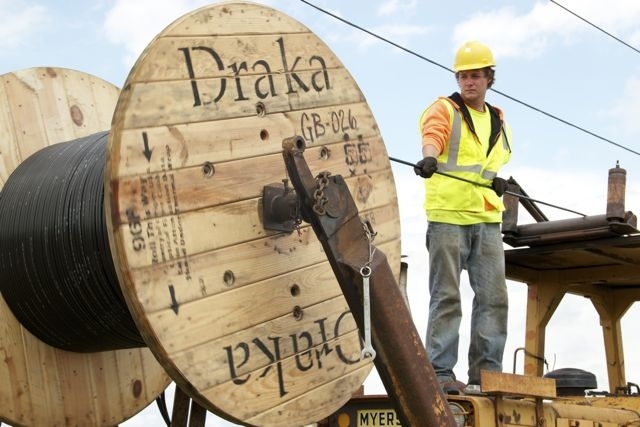 Thirty workers are constructing the network that is expected to spur more affordable high-speed broadband access for approximately 737,000 households,165,000 businesses, and 2,900 institutions. Underground construction started in the Wayne Trace Local School District, which includes a high school and two elementary schools. The area has some level of existing wireless Internet currently, but storms and high winds regularly knock out the service. Com Net’s underground broadband network will provide steady, reliable Internet service to these schools as well as the residents in this district. Com Net’s network will also enable more than 300 public safety agencies to upgrade their radio towers and public safety answering points from T-1 lines to speeds of up to 10 gigabits per second (Gbps), so they can deploy next-generation devices and enhanced 911 capabilities.